I knew I had to use my mother’s Pineapple Bread Stuffing, and this crown roast was the perfect opportunity. From my cookbook, Meat: Everything You Needed to Know. 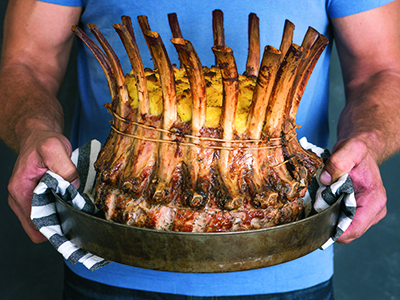 Ask your butcher to tie a crown roast from two frenched 8-rib pork racks. Or french the racks, sear them, and then tie them yourself. 1. Position an oven rack in the lower third of the oven. Remove any racks above it and preheat the oven to broil (set it to high). 2. Season the crown roast all over with the salt and pepper. Place the roast, bones sticking up, on a baking sheet. Cover each bone with foil to prevent the bones from burning. Put the crown roast under the broiler until the meat is seared to deep brown, about 15 minutes. Remove the crown roast from the oven. 3. Reduce the oven temperature to 350°F. 4. Season the outside of the crown roast with the thyme. Spoon the stuffing into the center of the crown roast. Roast the crown roast until a meat thermometer inserted into the thickest part registers 135°F, about 1¾ hours, taking the foil off the bones about halfway throughout cooking time. Remove the roast from the oven and set it aside to rest for 20 minutes before cutting into it. 5. Slice in between each rib bone and serve each chop with the stuffing on the side. This stuffing is like a sweet bread pudding, served hot, and can be served as a side dish. 2. In a large bowl, cream the butter, sugar, and salt with a whisk for 1 to 2 minutes. Add the eggs one at a time, beating each one into the butter mixture before adding the next one. Add the pineapple and stir to combine. Add the bread and fold it in until it is evenly coated with the butter and pineapple. 3. Use the stuffing to stuff the Crown Roast of Pork or spoon it into a 9 x 13-inch baking pan (or two 8-inch square pans) and bake until the top is golden brown and crunchy, 45 to 55 minutes. 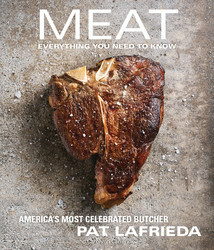 Pat LaFrieda, the third generation butcher and owner of America’s premier meatpacking business, presents the ultimate book of everything meat, with more than seventy-five mouthwatering recipes for beef, pork, lamb, veal, and poultry. Pat LaFrieda’s first introduction to the meat world was in the summer of 1981, when he was just ten years old and learning the tricks of the trade at his father’s butchering business. Thirty years later, Pat, his father, and cousin own and operate New York City’s most prestigious and valued meatpacking facility. Pat LaFrieda Meat Purveyors supplies the finest restaurants in New York City, Philadelphia, DC, Las Vegas, Miami, Chicago, and more. They also operate four retail locations at Citi Field—home to the New York Mets—including two Pat LaFrieda Original Steak Sandwich stands, a LaFrieda Meatball Slider stand, and the sit-down restaurant, Pat LaFrieda Chop House. In 2014 they became the "Official Burger of the Mets."